CF Moto Australia will offer the Quadbar roll‐over protection device as an optional safety device through its nationwide dealer network. CF Moto will partner with QB Industries, the manufacturer of the Quadbar to introduce this safety initiative. The Quadbar is just one of a range of safety initiatives currently in progress for the fledgling brand and its importer Mojo Motorcycles, and will be available through the CF Moto dealer network as an optional safety device. CF Moto National Sales Manager, Alan Collins explains that the company will continue to place a heightened focus on quad bike safety and assist in a cultural shift towards safety in the agricultural market. The Quadbar roll‐over protection device will be made accessible to customers, who in turn can make a call on whether they need the safety device in their specific environment and under their particular conditions of usage. Customers, who feel that this device can add value to their safety and the safety of their staff or family, can have it fitted through CF Moto’s authorised dealer network. As standard process with many aftermarket options, customers will need to sign a form authorising the dealer to fit this optional safety device on their behalf. 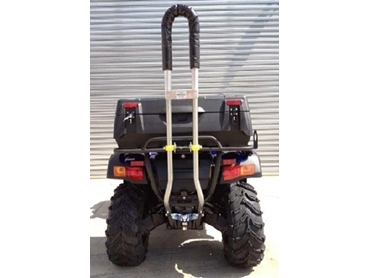 With the UTV (utility vehicle) and side x side market in a sharp growth phase, CF Moto is also looking at these vehicles as a great tool to enhance safety on Australian farms. Collins says that their UTVs and side x sides offer a readymade safety alternative as they are fitted standard with safety features such as a roll cage and seat belts. CF Moto is preparing to officially launch their Rancher 800i utility vehicles in January, which will complement the existing range comprising of the Rancher 500 and Rancher 600i. The 800cc Z8 sports side x side will also be launched in early Q2 2013 in addition to the all‐new Z6 EX just after Christmas.